Keeping your bike in good repair increases performance and safety. Have your local bike shop do an annual check-up and refer to the 8-point checklist regularly. Tires — Look for rips or cuts, sidewall bulges, cracking or loss of tread. Replace if needed before tube is damaged. Spokes — Check for bends or breaks. Tighten loose spokes. Broken spokes may mean a bent rim needs to be replaced. Rims — Bulging spoke holes and sidewalls affect breaking. Try to flatten spoke hole bulges by squeezing with pliers. Freewheel — Pedal hard in each gear to check for skipping cogs. Replace worn cogs or entire freewheel. Clean by removing wheel and running a rag between cogs. Chain — Replace chains with rusted or frozen links. Remove dirt and lubricate with chain lube where chain passes over freewheel. When you lubricate the chain, there should be no excess (dripping) lubricant – if there is, wipe away with a rag. 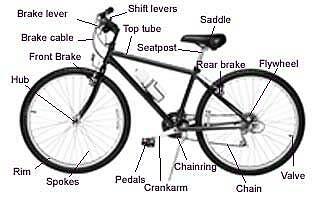 Crankset — Creaking noise indicates a loose chain ring or crank arm bolts. Replace chain ring that has worn or broken teeth. Make sure the cranks are tight by rocking from side to side - they should not move laterally. Pedals — Roughness indicates pedals need to be repacked with grease. Tighten loose pedals on crank arm. before touching the handlebar. While riding, test each brake alone. The rear brake must be strong enough to skid the wheel when applied firmly. The front brake, when fully applied, should lift the rear wheel off the ground. Inspect brake pads. If surface is worn away, pads should be replaced. The forward part of the brake pads must strike the rim first to prevent squealing.